The wonderful Women in Theory (WIT) biennial series of workshops started in 2008 and the 6th meeting will take place at Harvard University, Jun 19 – 22, 2018. Please see below the call for application. WIT is one of my favorite (if not the favorite) program in the theory community. I was lucky enough to participate in the outskirts of two WIT meetings, but naturally and rightfully never took part of its inner sanctum. So how can I vouch for an event I never fully attended? Experiencing the passion of the organizers, and most notably of Tal Rabin, and the enthusiastic reactions of its participants, there can be no doubt. I am far from being the only one feeling this way, and this year both Harvard and Stanford competed to host the workshop. So if you fit the workshop’s qualifications – please do yourself a favor and apply! 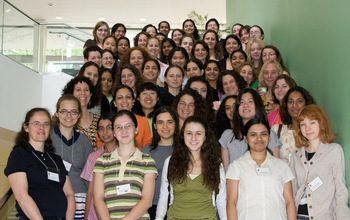 We will have a “Women In Theory” workshop for female graduate students and exceptional undergraduates (fourth year) in theoretical computer science at Harvard University, Cambridge, MA from Tuesday, June 19 to Friday, June 22 , 2018, https://womenintheory.wordpress.com/ . We are writing to draw your attention to the workshop and ask you to inform female students in your department about this workshop. The workshop will have first-rate technical content and will be a great opportunity for students to meet their peers from around the world. We have received very enthusiastic feedback from participants in previous years and we think that this could be an exciting event for your student as well. Please forward this email to the female students in your department. We will supply dorm rooms, breakfast and lunch, and will probably also be able to cover at least part if not all of their travel expenses. It would be great if you would be able to cover the remaining expenses. For any questions, please email womenintheory2018@gmail.com. The deadline to apply is January 16, 2018. Each student applicant needs to finish the application form on https://womenintheory.wordpress.com/apply/ , and her advisor also needs to supply a short letter of recommendation.